SAN FRANCISCO, CALIFORNIA, UNITED STATES, April 15, 2019 /EINPresswire.com/ — On the 25th January 2019 Girikon team members Sonika Tomar, Salesforce Consultant and Awanish Shukla, Lead Architect joined Satya Sekhar, Senior Salesforce Evangelist to participate in Girikon’s first Salesforce webinar with great reviews and a fantastic turnout. Sonika is an active member of the Salesforce Community and Awanish is a CPQ expert has 13+ years-experience in various domain and specialises migrating customers from various CRMs in the market to the Salesforce Platform. 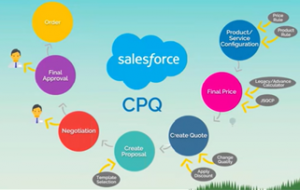 The webinar followed an interesting and engaging format which was led by questions from Satya and webinar provided a high level view of Salesforce CPQ which included how the quote process works without Salesforce CPQ, how CPQ assists with the lead to quote process including increasing quotation creation, elimination of errors in quotation, reducing the reliance on memory for different price and discount rules and the ability to auto generate documentation such as quote. For an audience which were interested in the technical aspects of CPQ and how to migrate from legacy CPQ to the Advance Calculator Sonika gave a concise and important introduction to CPQ including running through a complete CPQ process and an explanation on the Product and Price rules used by the quote calculator and the type of products rules. This was great introduction to the webinar and got everyone in the mood to jump into the technical aspects of the webinar and what they were all there to hear. The webinar continued to provide the audience with priceless information, tips and guidance on formula level changes required before migration, what was supported and not supported in the framework. Guidance and further content were given to know before starting with JSQCP including moving complex logic, workflow builder updates and security. Satya, continued to lead with questions which shaped the rest of the webinar and provided the audience with hands on scenarios. Sonika and Awanish completed the webinar with a demonstration which included three common requirements which are common in most CPQ implementations. The webinar was a success and showed how Advanced Calculator can boost the runtime of quote creation, the audience discovered what to consider before migration, understood the quote calculator, security plugins and learnt more about price rules, product rules and promises in quote calculator. Girikon is proud of the team and congratulates all involved in setting up and successfully completing its first webinar. Our experienced and certified Salesforce Consultants include Salesforce Architects, Platform Developers, Salesforce BA and Salesforce Admin. Ask Girikon about your next Salesforce Implementation, IT development project, migration, Integration (MuleSoft) or Salesforce support. Girikon Australia can be contacted toll-free on +61 1300 332 888 and can be found at Level 1 & 2 161 Collins Street Melbourne. Girikon is headquartered at Phoenix, USA 15433 N Tatum Blvd #105, Phoenix, AZ 85032, USA and can be contacted at +1 480-382-1320. Visit www.girikon.com for further details on next webinar in May 2019.